Welcome to Columbia Gorge Physical Therapy & Sports Medicine! To create meaningful change in people’s lives through education, integrity, and positive outcomes. Columbia Gorge Physical Therapy and Sports Medicine represents our vision of what we believe health care should be – exceptional service in a comfortable environment. music with our noise cancelling headphones. Chat with our front desk to get scheduled! Bettina is now TPI Certified! Columbia Gorge Physical Therapy Staff Uses Focal Upright Furniture - Shop Now for Active Office Solutions from Focal Upright! 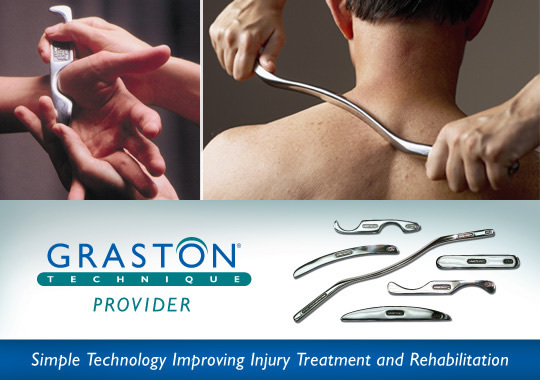 The Graston Technique®, originally developed by athletes, is changing the way clinicians — including physical and occupational therapists, hand therapists, chiropractors and athletic trainers — and patients view treatment of acute and chronic soft tissue injuries. The laser is applied directly to the target area and the tissues absorb the light which converts the light into chemical energy to promote healing. LLLT is different from other types of lasers such as those used for surgery to cut, destroy or coagulate tissues. The low level of light is not enough to heat your body’s tissue. Sign up for valuable tips on feeling your best!